This year it’s pretty clear that WhatsApp isn’t holding back on new features and service iterations. From letting you send documents, end to end encryption, increasing group limits and more recently working through Siri, there’s been a lot of new additions to the popular chat platform. So what’s the latest feature on WhatsApp? Well, other than the option to send GIFs there are actually a number of new additions for users who have signed up for Beta testing and are on the latest version the app. Good news for everyone who’s always plugged into WhatsApp Groups. WhatsApp has finally introduced a tagging feature that lets you tag a specific group member. To do this you add the character ‘@’ before the user’s name. It’s essentially the same sort of tagging that you do for Twitter and Facebook. It works for Android and iOS but hasn’t been activated for WhatsApp web. When we tried out the service on Android it didn’t offer any special notification for the mention (i.e the person tagged) so it’s still just another Group message. the only difference is a highlight on the tagged name. Since this is still a beta service the hope is that WhatsApp will work on completing the tagging feature so that it becomes the best way to check up on messages meant for you in the sea of texts that group chats tend to turn into. 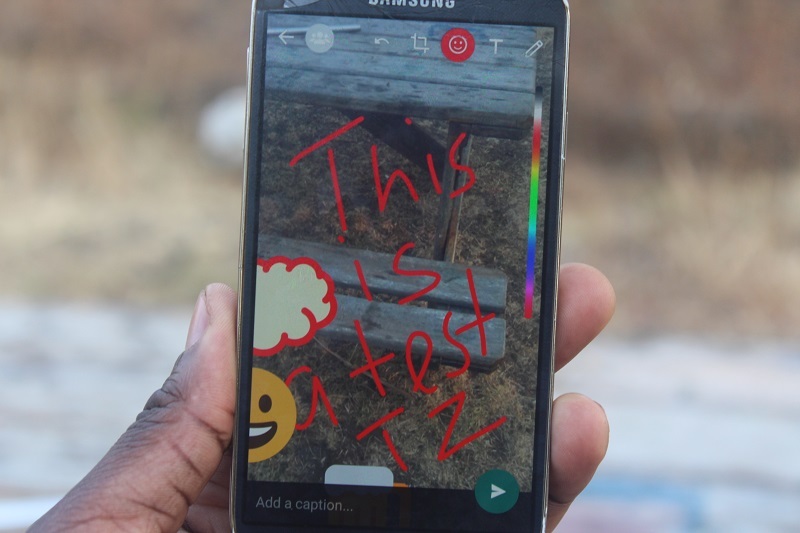 This was taken straight from the Snapchat playbook – you can now edit photos that you take within the app using emoji, cropping and writing on top of them. If you are using the latest version of WhatsApp (so far we’ve only tried it successfully on Android) and you take a photo within WhatsApp you will notice some editing tools on the top of the image including options for colour that’s meant for text. Any changes made to the pictures can be undone (there’s a button for that) and WhatsApp has also included several emoji and stickers to increase the options for expression using this feature. This new feature works by lighting up the screen when photos are taken in the dark, something that ought to make night time selfies a lot clearer for anyone using a device without a front flash feature. While all these cool features aren’t yet available for all devices it’s only a matter of time before every user has access to them. What’s interesting though is how WhatsApp is incorporating “new” features that have essentially been available on other platforms. All of its new features in the past year have been “inspired” by other Instant Messaging (IM) and social media platforms with Instagram and Snapchat just being the latest. At this rate, we’ll see more features unique to other services ending up on WhatsApp.